I would like to ask anyone who has done DNA testing at ancestry to link a tree to their test. You can make multiple trees at ancestry which means that you can create a DNA tree. This means that your whole family tree does not have to be made public. What I did is create a DNA tree which is now linked to my results. In doing that my DNA matches can quickly see if we have surnames or locations in common. It actually didn’t take too long and it makes my results more meaningful. I would also encourage people to take this test. Ancestry’s DNA pool is growing and it is a wonderful way to find cousins, who knows they may have a picture of one of your ancestors that you don’t. Happy spitting everyone! I feel like I am pretty Irish. Researching back through my tree I have spent a lot of it stuck in Ireland. I would go back one more generation but most of my 3x great grandparents birth locations are unknown. 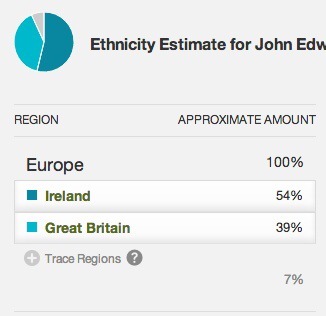 My brother did the DNA test at Ancestry and although our breakdown would not be identical it does show him to be predominantly Irish. I guess it is not a stretch that I can identify with St. Patrick’s Day!